I’m rockin’ and rollin’ today. Talking about bathroom decorating and how my new bathroom decor came together. It all started with a new shower curtain. I bought the shower curtain in October (2016) and just last week opened the package. That’s the way I work. But there is a story so keep reading. First we’ll take a look at the bathroom before I redecorated. 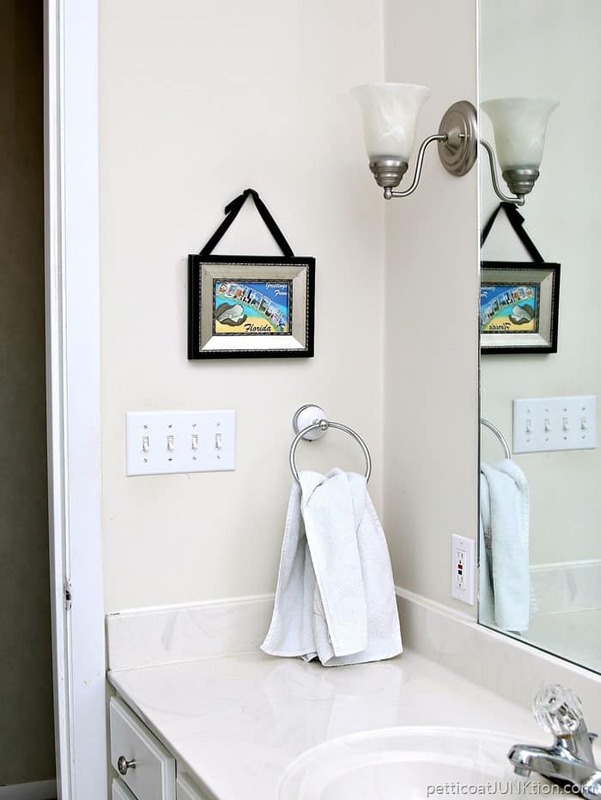 The art work over the commode is one of my DIY’s. Not my favorite but Sofi and the JTS liked it so I left it up. I painted the unfinished wood crates last January and they work great for corralling personal stuff and guest wash cloths. The one for the wash cloths sits on the back of the commode but I hide it in the cabinet until we have guests. 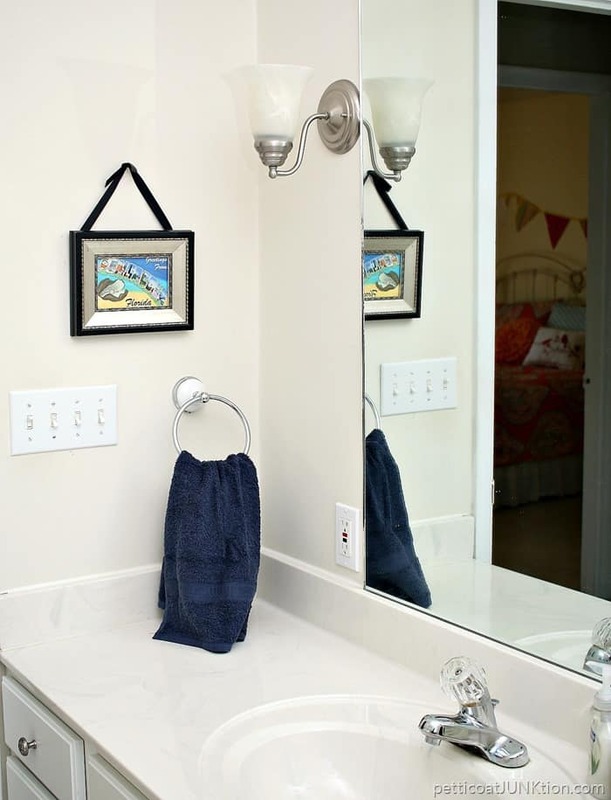 The framed photo over the towel holder is a “Pensacola” postcard. I bought the framed postcard when we lived in Florida. I added the ribbon as a hanger just for a little different look. Plus I didn’t have to put another nail hole in the wall. There’s always a method to my madness. Before the postcard thing I had something else hanging in that spot. It was longer than it was wide. So to make the framed postcard look right hanging in the spot I added the ribbon. Ta-dah. No new nail hole. This shower curtain has probably been hanging here for 3 or 4 years. I can’t really remember. 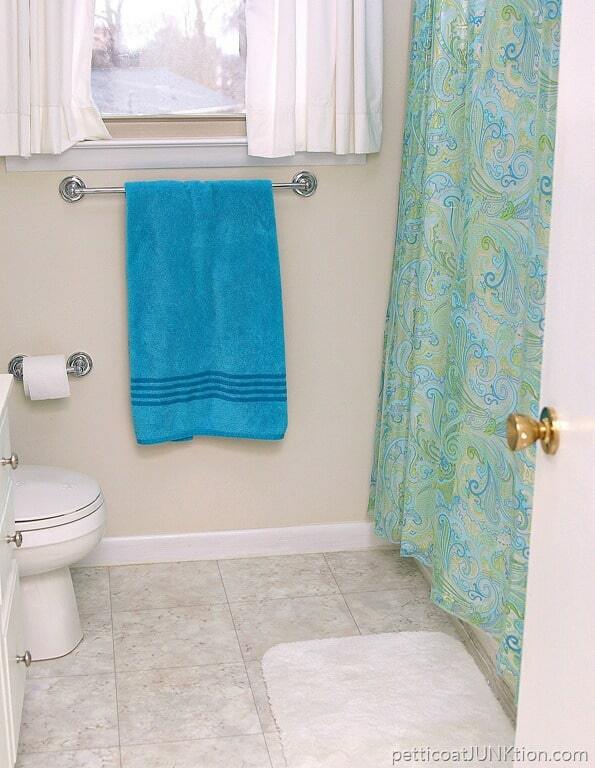 The shower curtain is clear vinyl with a pretty turquoise and green design. The curtain liner is white. I think I bought the shower curtain at T.J. Maxx for $5 or $6. Always thrifty. Back in October I went to a blogger get together at World Market. Well, I had to shop while there. The pretty Gabriella Shower Curtain was on sale for $17.99. Not a steal but a pretty good deal. Especially considering I don’t buy new shower curtains very often. With Christmas and all that coming up I laid the shower curtain on the bed in the back bedroom. You guys probably remember what the top of that bed looks like. Moving on to December. I was shopping at Ollie’s Army. My first time. Have any of you guys ever shopped at Oll’ies Army? It was a little wild. 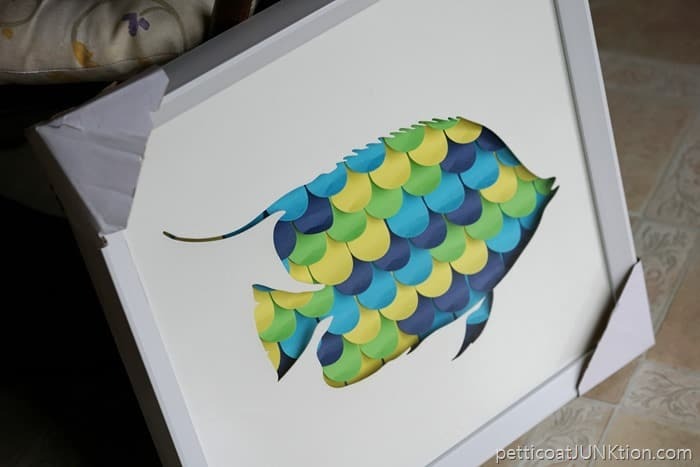 I spotted the “Fish” wall art and thought of the colors in the shower curtain. 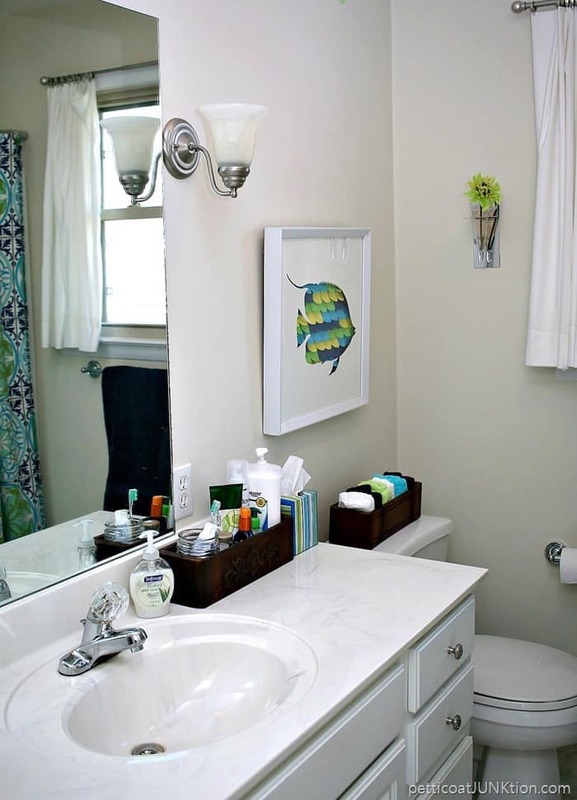 Fish…..bathroom…..perfect. The “Fish” was $10. I took it home and tossed it on the bed in the back bedroom. See a pattern? Moving on to late January 2017. I decided it was time to clean off the bed in the back bedroom. That meant finally hanging the shower curtain and the fish (and putting away the Christmas wrap, décor, etc.). I made a quick trip to Wal-Mart to buy a navy rug, bath towel, hand towel, and a couple of wash cloths. Might as well go all out. So this is what it looks like now. 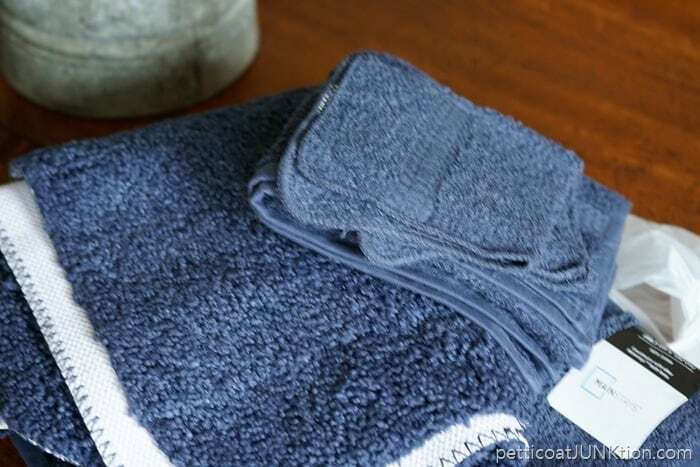 I bought the navy bath mat and towels because navy is in. Also the color is more dramatic. With the darker colors in the shower curtain I decided to replace the white wood crates with vintage sewing machine drawers. I just happened to have a couple in the workshop. 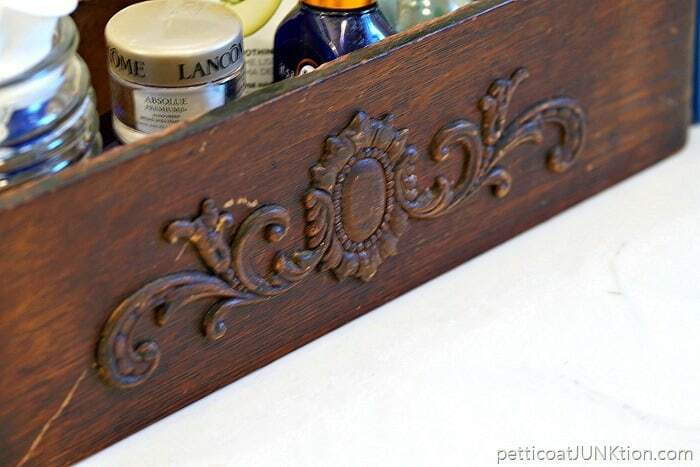 Once upon a time I used this one with the decorative wood applique to hold cook books on the kitchen counter. Turns out the drawers were the perfect size to hold my bathroom products and the guest wash cloths. 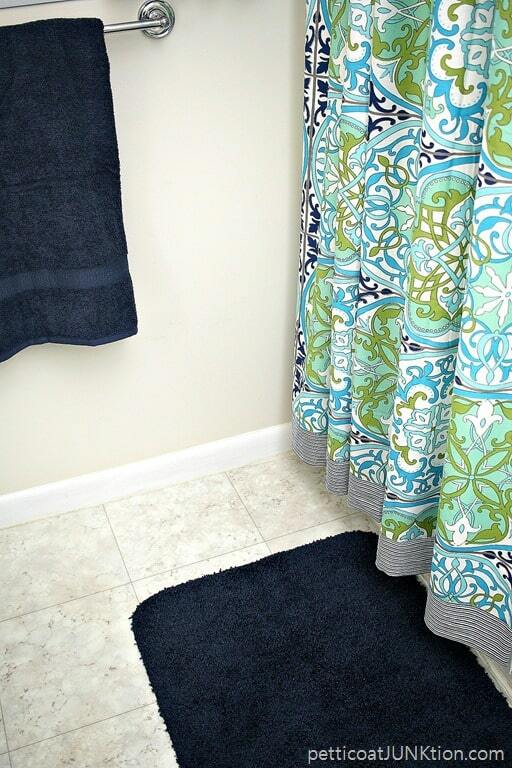 I love the deeper, richer, colors of this shower curtain versus my old one. The navy stuff from Wal-Mart was a pretty good match too. I hung the full length mirror on the back of the bathroom door many years ago. I think about 15 years ago to be exact. The towel hanger/picture holder has been there a while too. I decided my paint-by-number yard sale buy would look awesome with the new stuff…. and it does. 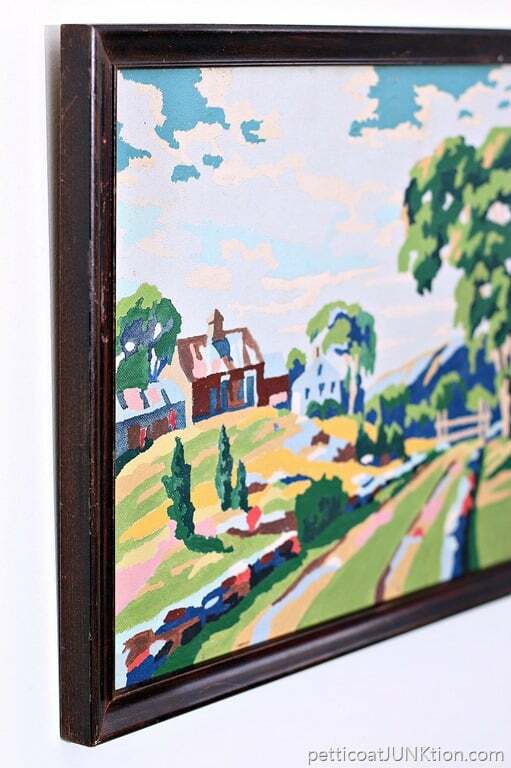 There just happened to be a nail hole in just the right spot to hang the paint-by-number. (That’s my leg in the mirror…. colorful spotted house shoes and paint splotched work out pants). This is the first vintage paint-by-number scene I’ve ever liked. Maybe my tastes are changing. I left the framed “Pensacola” postcard right where it was. I searched Amazon in case any of you guys wanted to buy a shower curtain just like mine. I found one but you won’t believe the price…….$88.95. Who in their right mind would pay that much for a shower curtain. I then went to World Market online and the shower curtain is on sale for $13.48. Much better. 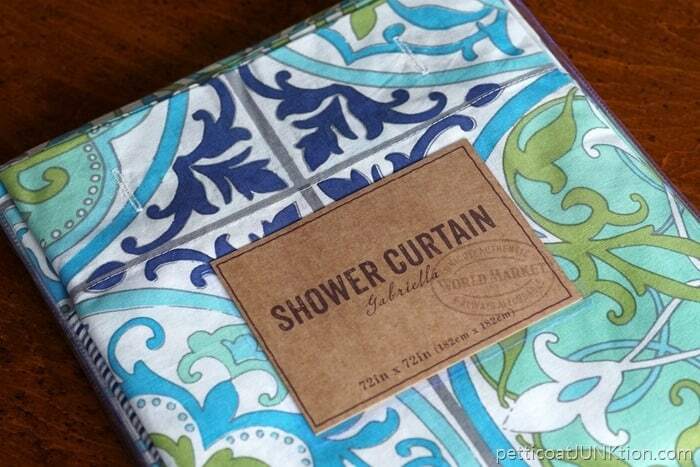 Here is the link to World Market…Gabriella Shower Curtain if you’re interested. My bathroom decorating or redecorating cost less than $50. Using things I had on hand helped me give the bathroom a whole new feel. I love the deeper, richer colors….and the fish. The only thing I’m not happy with are the white pillowcase curtains. I’m ready to get rid of them or do something to them. Still thinking. Did I have to redecorate? No, but it doesn’t hurt to make changes if it’s been a year or two or six. I figure this $50 makeover will last for a year or two or six. What do you guys think of the changes? Leave me a note in the comments please. Have a great day! You are so talented, I love what you did to the bathroom. I like how your bathroom turned out! The colors are my colors too! We just moved into a new-to-us home and I am struggling to decorate the master bath. It doesn’t help that it has speckled blue tile from the 60’s! I take awhile to get it together just like you! I bet you can work in a color scheme that will make those speckled tiles shine Pam. Let me know when you get it together, bwahahaha. Glad I’m not the only one. Love those vintage drawers! Adorable! Fabulous job. I love everything you did here. Gorgeous. I agreed with Judy above about trim on curtains, but have decided they are just too limp. Like idea of shutters on lower part or café style spring rod for lower part. Then you shower curtain will make a better statement ~ not competing for height of curtain. Kathy, your bathroom looks to be the same size and lay-out as mine is. I like yours better than mine in some respects, though. First of all your up-dates are nice–good changes. But what I like best is your tile flooring! My bathroom has ceramic tile flooring but the tiles are about an inch square. Do you now how much grout that is to clean? Plus, they are original to the house which was built in the ’60’s. Uuugly! I’ve been wanting to replace them but haven’t known what I want in new tiles. Until—I saw your bathroom floor! It looks perfect for the size of the bathroom and the color is exactly right. I ‘m wondering if you and the JTS put it in and, if so, could give me the exact dimensions of the tiles and where you found them. That would be super! I’m so excited to have seen your bathroom and its floor! Now I know just what my bathroom floor needs! Thanks a million for your post! Naomi, I have a surprise for you. The flooring is vinyl. Not tile at all. We got rid of all the tile on the walls, counertops, etc. when we had the bathrooms remodeled about 15 years ago. Good luck getting rid of the tile. I feel your pain. Fun, fun, fun! Nice way to use sewing drawers. The fish looks great where you put it. I think white shutters would look nice in the window or white wood blinds. Blinds are nice as they can let as much light as you want plus provide privacy. I think there were shutters on the windows when we bought the house but that was 28 years ago. I love wood blinds but they won’t work because our window casings are old style and too narrow for the blinds. I like it very much. Even the old version is great. I had the same toile shower curtain for over 10 years. I decided to redo it and am unhappy with my result. You have given me inspiration to try again. 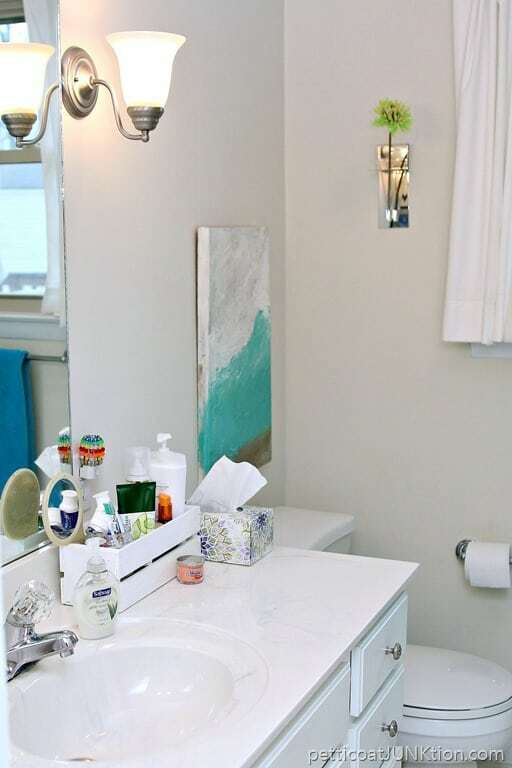 I love the style of your bathroom redo—colorful but not overstated, fresh and “guest friendly”! Love the sewing machine drawers, also! Love the changes. Brightens the room. Those are my favorite colors. I think your changes look really cute. It’s always nice to have a few changes. Love, love, love the new colors!! The green really makes it “pop”!! I agree about the curtains, though. I could see some pretty white balloon curtains there. Make it look crisp and clean. 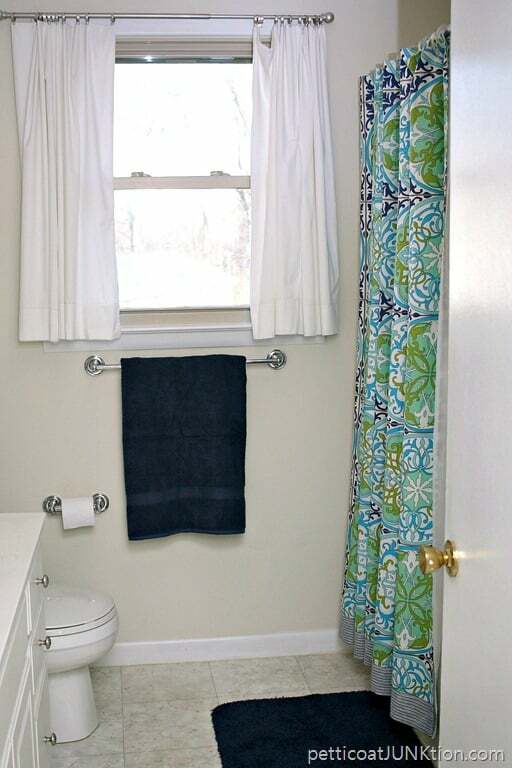 Add some cute trimmings to the pillow case curtains to jazz them up – or find dish towels or a table runner in similar colors to make a valance/curtains. I agree, the window needs some COLOR! lol Great job and thanks for sharing! I bought a shower curtain and had bathroom curtains made too. Looks awesome. Looks lovely, Kathy…. great job! Looks great! Nice to get a little lift at this time of year for such a reasonable price! If you can still get another shower curtain for $13. Get it and make curtains! Plus you will probably have some leftover fabric for another project!!! A win win!!!!! Great make over, and I love the new, richer colors. I love the old drawers for all those misc. items too. 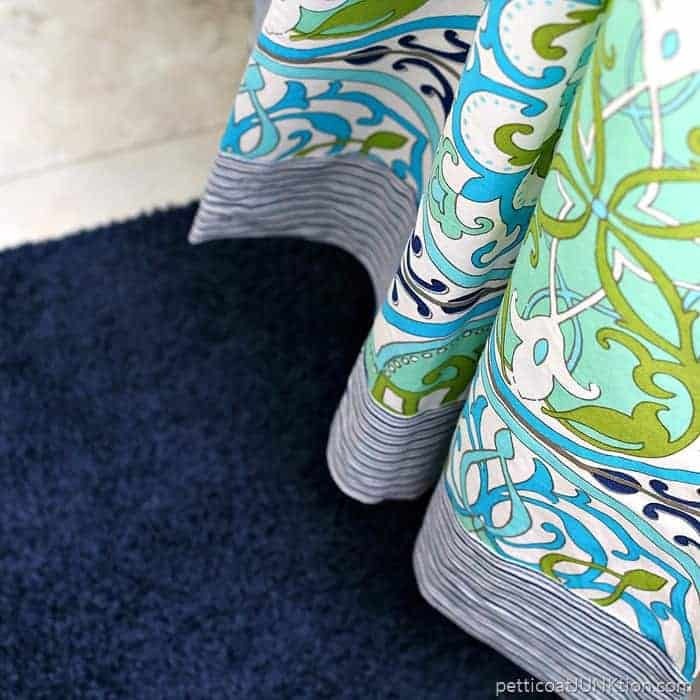 For the windows, maybe a shade with a color-coordinated valance for a crisp update. Thanks for sharing! I went to the World Market web site and the shower curtain is not available at this time. Tracking it!